Today at the E3 video game conference in Los Angeles we sat down with Game Director and Executive Producer Todd Howard for a 30-minute demonstration of Bethesda Softworks' The Elder Scrolls V: Skyrim, the sequel to 2006's best-selling role-playing video game The Elder Scrolls IV: Oblivion. Like its smash hit predecessor, Skyrim simulates an expansive fantasy world and lets you explore it at your own pace, taking on quests or challenging enemies whenever and wherever you want. This time the story is about preventing a dragon-caused apocalypse by slaying dragons to learn their language and capture their souls, but as with previous Elder Scrolls games you don't have to participate in the story if you don't want to. Instead, you can join guilds for warriors, thieves, or mages, or just help — or hinder — townsfolk you meet in your travels. 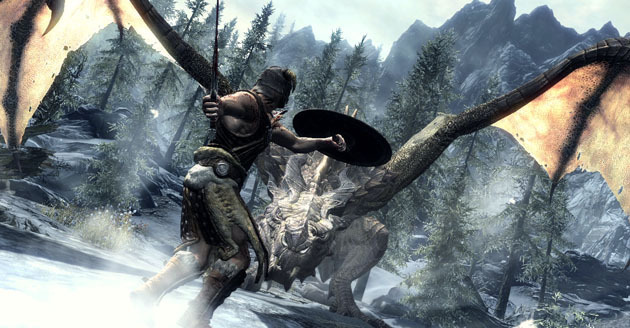 The Elder Scrolls V: Skyrim arrives in stores November 11, 2011 for Xbox 360, PlayStation 3, and Windows PC. Here are our first impressions from the demonstration. Have any questions? Let us know in the comments. The bottom line: If you want to spend dozens of hours exploring and mastering a detailed fantasy world filled with dragons, spells, lore, and whole societies of townspeople, you'll want to pick this game up when it comes out. Each Elder Scrolls game takes players to a new region of the fantasy world of Tamriel; this time it's Skyrim, the Norse-inspired northern highlands. 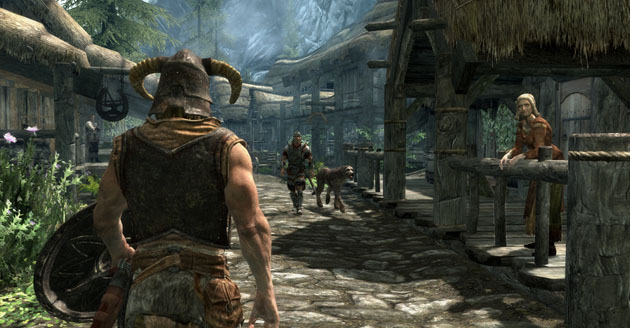 In the live gameplay demonstration we saw, the player's character has just emerged in Skyrim, and he is walking down a mountain road, surrounded by trees and other greenery. Snow falls, whitens the landscape, then melts, depending on dynamic weather conditions in the game's virtual world. A fox wanders in to the road, sees the player, then becomes startled and flees into the bushes. The player walks over to the greenery and picks a mountain flower from its stem; these flowers can be used to craft potions that can give you an advantage on your quest. Howard noted to us that most game designers find ways to hide far-away things from view to save processing power for graphical effects, but keeping the player's viewing distance at a maximum for epic vistas was the priority instead while developing Skyrim. While the player can instantly travel on the map (which appears in full 3D after the camera zooms away from your character and into the sky) to previously-explored locations, detailed exploration is worth the time and trouble. Several "Guardian Stones" are scattered around the landscape. When you find them, they'll grant you special bonuses — for example, the "Warrior Stone" makes your combat skills improve more quickly. Howard also told us that there are thousands of objects to collect and examine, including 300 books to read rich with fantasy lore. Skyrim isn't just a land of trees and ruins, though; it's populated by virtual societies of characters with whom you can interact. The province of Skyrim is home to five major cities, some of which are homes to guilds that send the player on quests. We only saw one major city — Whiterun, home to the Warrior's Guild — and even then only from a distance. However, we got a detailed look at one of the numerous smaller towns. Called Riverwood, it's an idyllic collection of wood and straw homes, with a lumber mill, a blacksmith, and other medieval-style shops. In an attempt to make the fantasy world convincing, the game's creators have given the various characters occupying these towns jobs and schedules — kind of like The Sims. In fact, each job plays a role in the local economy, which the player can influence through his or her actions. Sabotaging a lumber mill could have negative consequences for the community. The player can use the tools and benches scattered around a blacksmith's shop to repair equipment, and he or she can talk to the blacksmith, too. Oblivion zoomed in to characters' faces when the player talk to them, making it difficult to see what was happening in the world around. Now dialogue takes place through the player's normal viewpoint while the character walks around performing his or her usual duties. 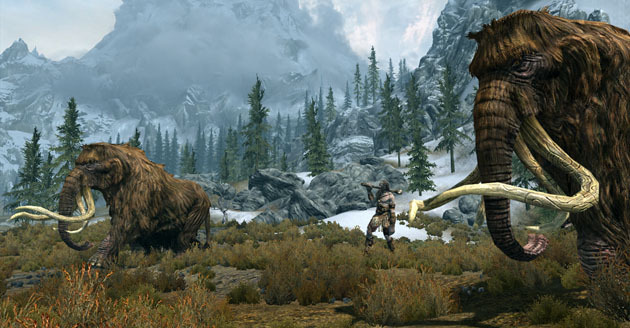 Even the animals and monsters of Skyrim have their own societies, lives, and rules. Wooly mammoths graze in the fields, but they usually won't harm you unless you actively disturb them. So what if you do actively disturb a monster in the world of Skyrim? Well, you'll probably have to fight it — and there is no shortage of ways to do that. You can map various spells and weapons to either of your hands — for example, you could place a sword in your right hand and a healing spell in your left, allowing you to use either with a single button press. In addition to those basic abilities, your character will learn powerful shouts in the language of dragons. These shouts are composed of multiple words, and the more words you use, the more powerful the shout. You can find the words hidden in dark corners of Skyrim, then unlock them for use by capturing dragon souls (more on that in a moment). Some shouts slow time to give you an advantage in combat, others propel enemies backwards, and others still attack them with fire or lightning. 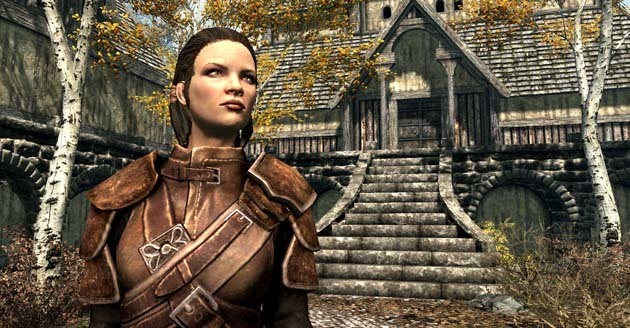 In Skyrim, your skills and spells become more powerful each time you use them. You won't spend too much time in menus spending "experience points" to upgrade your abilities as in other RPGs, though Skyrim does allow you to customize your skills. Each skill is represented by a constellation in the sky; select the skills menu and your character will look up to the heavens, and you can select the parts of the constellations you want to unlock. Each branch of a constellation adds new perks to the skill in question. There are numerous skills; some allow you to sneak past enemies, others let you block enemy attacks with a shield. We saw a wide variety of skills and combinations in the game demonstration. Howard wielded a sword in each hand, different combinations of spells, and more to defeat the enemies he encountered when wandering through a cave. Those enemies included bandits, undead viking warriors, a ghostly apparition, and most importantly, dragons. Dragons have always played an important part of the story of the Elder Scrolls games, but they will appear in earnest in Skyrim. The character you create and control will be descended from dragons, so he or she will be able to learn their language and absorb their powers for use in his or her quest. Dragons come in multiple varieties (we saw both fire and ice dragons in the demonstration), but they're all very difficult to kill. They fly in from the sky, pick people up with their jaws, and either tear them to death or cast them down at the ground. They breathe fire, bite, and attack with their claws. Howard defeated two dragons in his demonstration. Both required several hits and some creative swordplay. He slew the second one in a spectacular execution animation — something new to the Elder Scrolls series. When he killed each dragon, he absorbed its soul and used to unlock a new dragon language word. Howard told us that this process plays a central part in Skyrim's storyline. He also said that the player will have to slay many dragons to complete the game. Between those dragons, the central story quest, the guild quests, side quests for various townspeople, and 150 dungeons that change and adapt to where you're at in the game and how you've played so far, we expect Skyrim will keep you entertained for dozens if not hundreds of hours if you're up for that kind of gaming commitment. 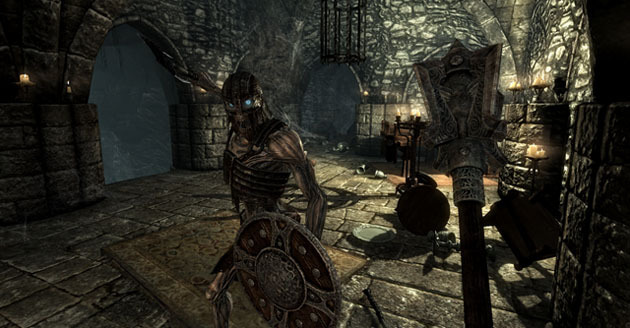 Judging by the success of Skyrim's predecessor, we suspect a lot of you are!